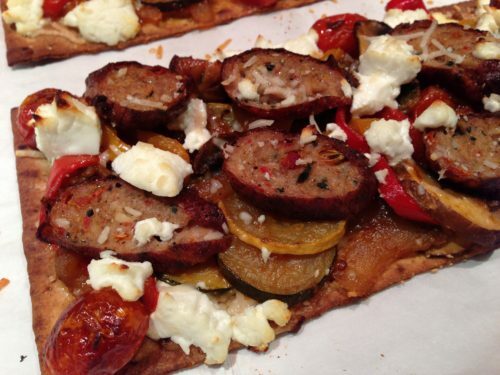 Smoky Vegetable Sausage Flatbread. 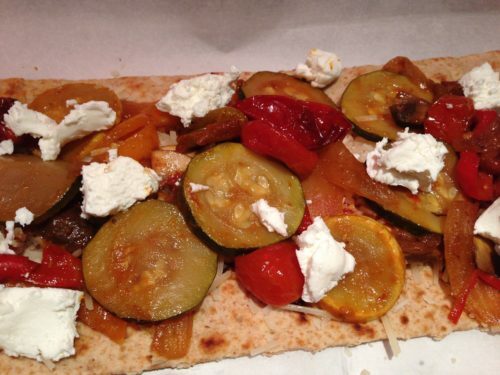 Flatbreads have become popular alternatives to heavier pizza crusts. A flatbread is a smaller size and thinner so it will become crispier than pizza crust when baked. I like to serve baked flatbreads with a salad for a light weeknight dinner. 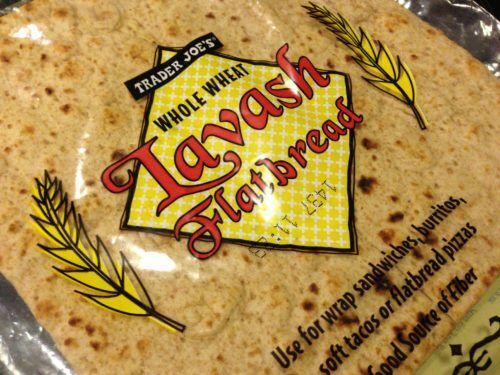 Trader Joe’s sells some nice whole wheat flatbreads in their fresh breads section. They come in a package of two large square flatbreads with perforations to tear into a total of four rectangular flatbreads per package. 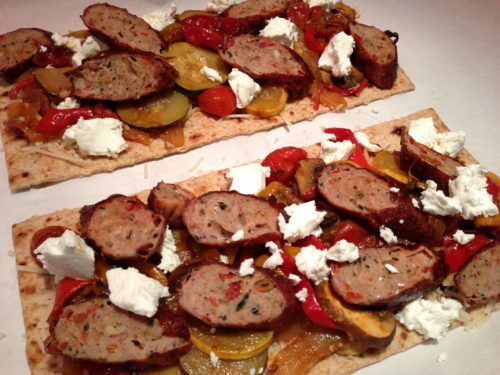 These flatbreads freeze well so you can stock up and have plenty available in your freezer. 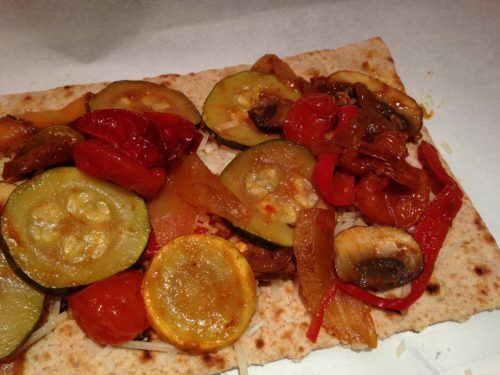 For this flatbread, I’m using my Smoky Vegetable Ragout as one of the toppings. 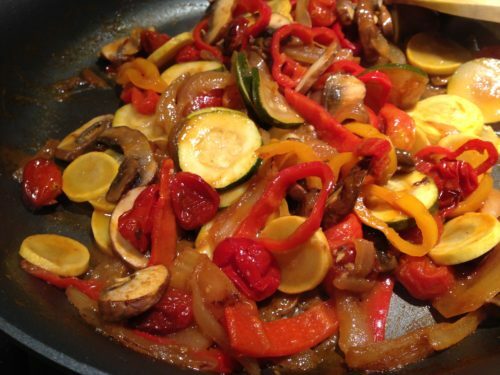 See my previous Smoky Vegetable Ragout recipe on how to make it. This smoky ragout is a great way to use that bounty of summer garden veggies. Shredded Parmesan cheese sprinkled on the flatbreads serves as a base for the vegetable ragout. Add the smoky vegetable ragout to the flatbreads. 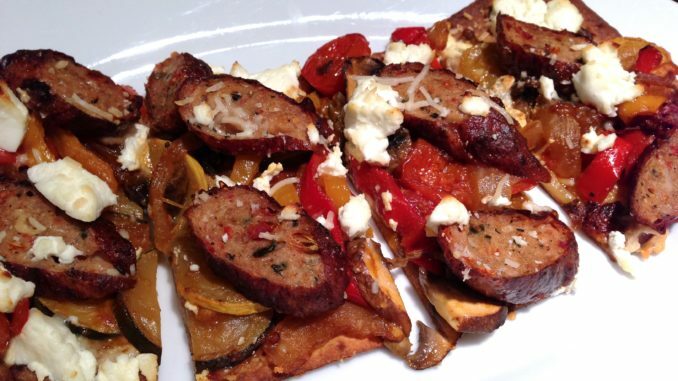 Sauteed and browned Niman Ranch Italian sausage, sliced into rounds, adds a hefty bite to the flatbreads. Crumbled goat cheese goes on just before baking. 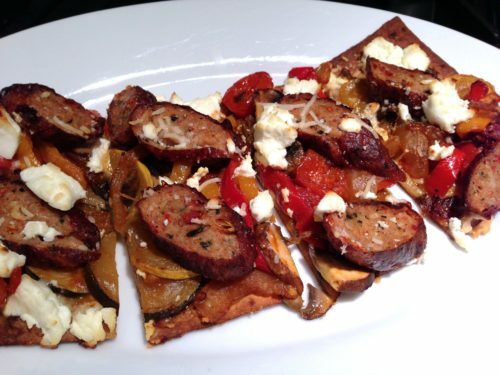 Or omit the sausage for a vegetarian flatbread. Bake until the flatbreads are crispy but be careful not to burn them. Remove from the oven and sprinkle with some additional parmesan and drizzle them with olive oil. 2. Warm the olive oil in a skillet. 3. Saute the sausages until they are browned on the outsides. Remove from the heat, slice, and set aside. 4. 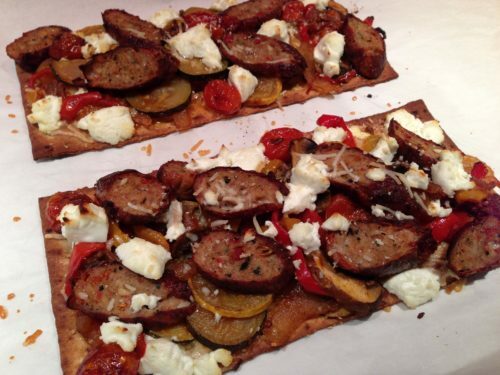 Place two flatbreads on a parchment paper-lined baking sheet. 5. 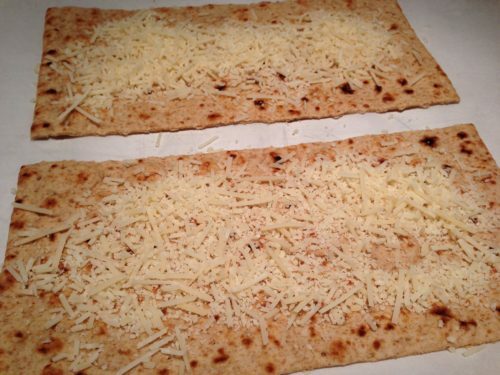 Sprinkle some parmesan cheese on two flatbreads. 6. Top the parmesan with the smoky vegetable ragout. 7. 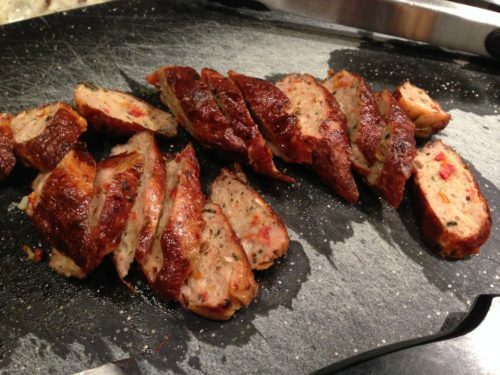 Arrange the sausage slices on top of the ragout. 8. Divide the goat cheese into small dollops and add to the flatbreads. 9. Bake the flatbreads until the flatbread base is crispy but not burned, about 10 – 15 minutes. 10. Remove the flatbreads from the oven. 11. 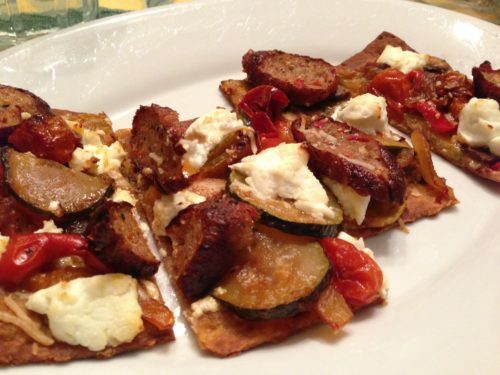 Slice the flatbreads into strips, sprinkle with additional shredded Parmesan, drizzle with olive oil and serve! Makes 2 flatbreads. Offer with a generous side salad of field greens and cherry tomatoes tossed with my favorite Tarragon Balsamic Dressing. Variations: Use your favorite sausage in crumbles or slices. 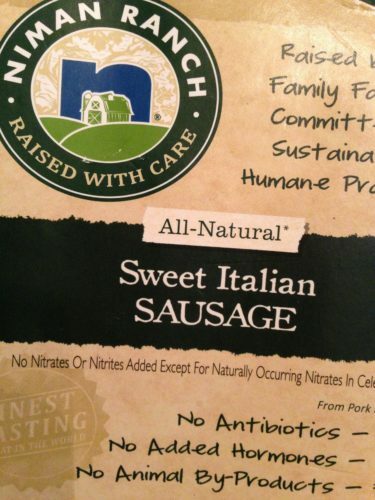 Omit the sausage for a vegetarian version. 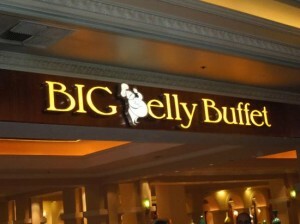 For a vegan version, use a slathering of vegan mayo instead of the base of Parmesan cheese on the flatbread. Use your favorite vegan cheese to top the vegetables and omit the sausage. 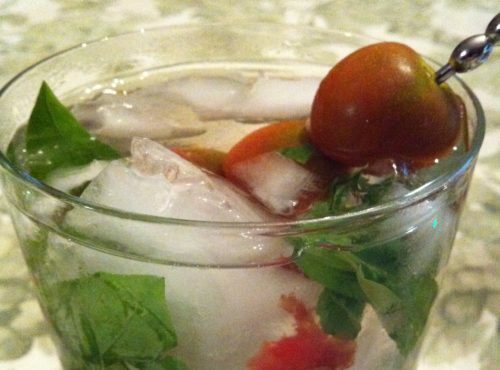 You can also garnish the flatbreads with chopped parsley or basil for additional color and taste.